We can't imagine our lives without the Internet. It is the tool of our existence; without it we couldn't work, plan our social and leisure activities, and interact with friends. The Internet’s influence on contemporary society extends across every aspect of our personal and professional lives, but how has this altered us in psychological terms? How are we to understand how the Internet can promote enormous amounts of caring and kindness to strangers and yet be the source of unremitting acts of terror? Why does our self-control abandon us sometimes on the Internet? Why does the Internet create a separate realm of social and personal relationships? How does all that change us as people? Are youngsters really as exposed and threatened on the web as people think? 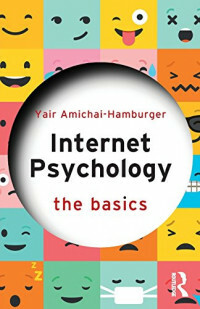 Internet Psychology: The Basics is a vital and fascinating guide to the online world, drawing on classic theories of human behaviour to shed fresh light on this central facet of modern life. It argues that, even in an age of constant technological advancement, our understanding of the human psyche remains rooted in these well-established theories. Embracing both positive and negative aspects of Internet use, this easy introduction to the subject will appeal to students and general readers alike.